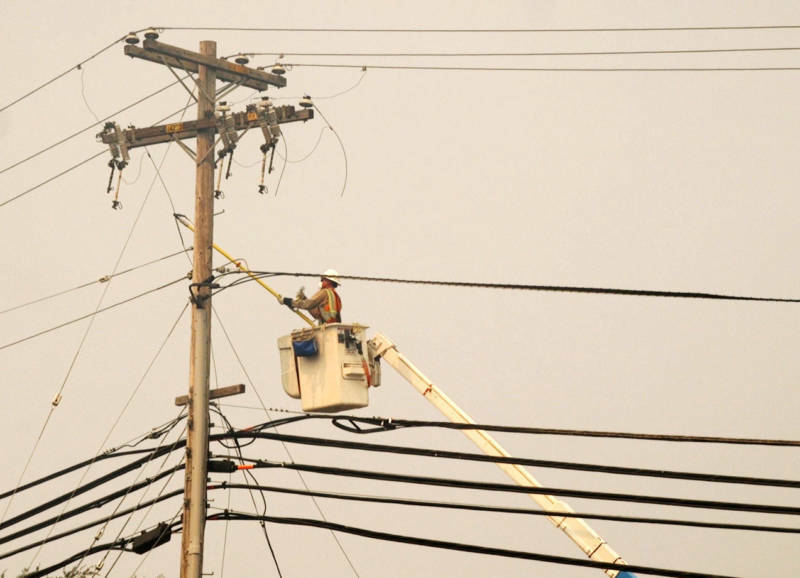 Should PG&E Shut Off Power During Windstorms to Prevent Fires? Investigators are still sorting out what caused the North Bay fires, but downed power lines are certainly one of the possible culprits. That has some asking why Pacific Gas & Electric didn’t turn off the power grid ahead of time, as the extreme, warm winds started picking up. Turns out, that’s something one California utility already routinely does. In late October, a red flag warning was issued in San Diego, as the Santa Ana winds began descending. San Diego Gas & Electric (SDG&E) tracked it closely with their network of 170 weather stations mounted on power poles. "You start seeing some of these gusts come through some of the backcountry areas that can threaten the integrity of our system,” says Allison Torres, spokesperson for SDG&E. High winds have caused major fires in San Diego before. In 2007, the Witch, Guejito and Rice fires burned hundreds of homes. 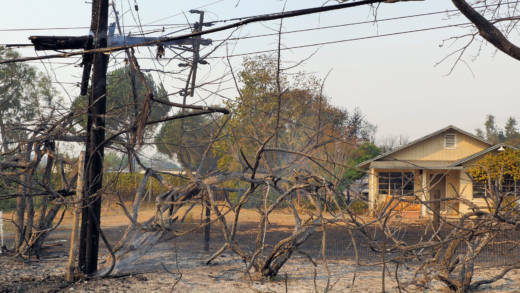 Investigators ruled that power lines were at fault and SDG&E hadn’t adequately maintained its facilities. So in October, SDG&E shut down the power grid preemptively in the Descanso area due to high winds, high temperatures and low humidity, affecting about 87 customers. “If something were to come in contact with the lines, there’s no energy flowing through them that might cause an ignition,” says Torres. SDG&E says the customers were alerted with automated calls warning them about the outrage. Households with medical devices received more direct outreach. “We reach out personally to make sure we make contact and they’ve made arrangements or have a backup plan,” says Torres. Power outages are never popular, but Torres says the utility usually receives only a handful of complaints. “Nobody wants to see a fire affecting their community,” she says, "so if this is going to give public safety a priority then people are pretty onboard." Since 2013, the utility has preemptively turn off the power 16 times, affect 1,000 customers in all. PG&E doesn’t have a policy to proactively turn off power lines during a warm windstorm, and says doing so could pose safety risks. “These actions affect first responders and the operation of critical facilities such as hospitals, schools, water pumps and other essential services needed in response to any emergency, and especially in response to wildfires,” the company said in a statement. PG&E says it’s in compliance with current fire regulations from the California Public Utilities Commission and will comply with any future changes. Proactively powering down is something that’s more common in hurricane-prone areas. “Relatively routinely, the barrier islands around the coastal areas will power down as a hurricane comes through,” says Rob Manning, Vice President of Transmission and Distribution at the Electric Power Research Institute. Manning says it’s a complex decision that requires adequate pre-planning. “I’ve been involved with a couple of these,” he says, "and when you have a really robust and effective communications process, people generally agree." So far, SDG&E has not shut off power systems that include hospitals or schools. “It’s certainly possible with adequate communications,” he says, "particularly if sensitive areas have backup generation capabilities." Powering down can also help avoid damage during a storm. Cal Fire says during a fire, crews generally treat all power lines as if they are live and are continually in contact with utilities about areas that need powering down. A Cal Fire spokesman wouldn’t comment on whether proactively powering down the grid would have helped during the north Bay Area fires, because of the ongoing investigation.